The first collector of this fine landscape was Joseph Ernest Sampson, a partner in the well-known Toronto commercial art firm Sampson Matthews Limited that employed fine artists such as A.J. Casson and Frank Carmichael. Casson began working for Sampson Matthews in 1926, and this gave him the financial stability he needed to pursue his painting without relying on sales of his work - which would have been risky at that time, even though in that same year, he became a member of the Group of Seven. Casson rose to vice-president of Sampson Matthews in 1946, a position he held until his retirement in 1958. 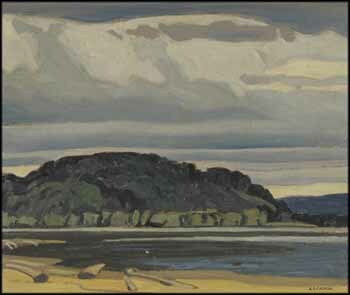 Algonquin Park was an important painting place for the Group, and Casson sketched there every year from 1942 to 1945. With its lakes, hilly land formations and big skies, it was emblematic of Ontario's wild north. Grey Day, Lake of Two Rivers, Algonquin Park captures these landscape elements brilliantly in a layered, atmospheric composition that takes us from the shore scattered with driftwood across the lake and up to a moody, weather-laden sky, immersing us in the beauty of raw nature.